I fancy myself a bit of a Words with Friends junkie. For those of you who have managed to escape the addiction, Words with Friends is the smartphone version of Scrabble and it allows you to literally have dozens of games going at once with your friends all over the world. Anyhow, I’ve previously written about my embarrassing hobby of attending Monopoly tournaments as a teenager, but it turns out that Scrabble tournaments are even more popular (and maybe slightly less embarrassing…lol). Hundreds of local Scrabble tournaments are held over the world each year and most of them award prize money to the winner. One of the best resources for finding tournament information is the North America Scrabble Players Association’s website (link). They’ve got a calendar of upcoming events along with entry fee and prize details for each tournament. However, most tournaments require that you first register as a member of the NASPA before you can play. It costs $30 a year (although, new tournament players can request a 6-month trial membership for $15). The NASPA also recommends that you join a local Scrabble club for practice play (link to full list). 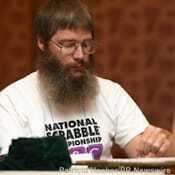 The 2012 National Scrabble tournament is being held in Orlando, Florida this year. If it’s anything like last year, more than 350 competitors will show up in August to fight for the crown and the cash. – In order to be eligible for the National Tournament, you will need to first participate in a local, sanctioned Scrabble tournament. That will establish your player rating and ensure you’re placed in the right division at Nationals. – Be prepared to cough up a steep entry fee. Entry fees start at $50 for minors and go up to $175 for Division I players. – You’ll need to book a hotel. Last year’s tournament went on for 4 days and the winner played 31 games before knocking out his last opponent. Why the tournament might be tough, it’s definitely worth it to the winner. First place takes home ten thousand greenbacks.